"The path, to the local foodstore and back"
In a period where Indie games release a plenty every week on the Xbox Store, sometimes games get left behind and quickly forgotten about. 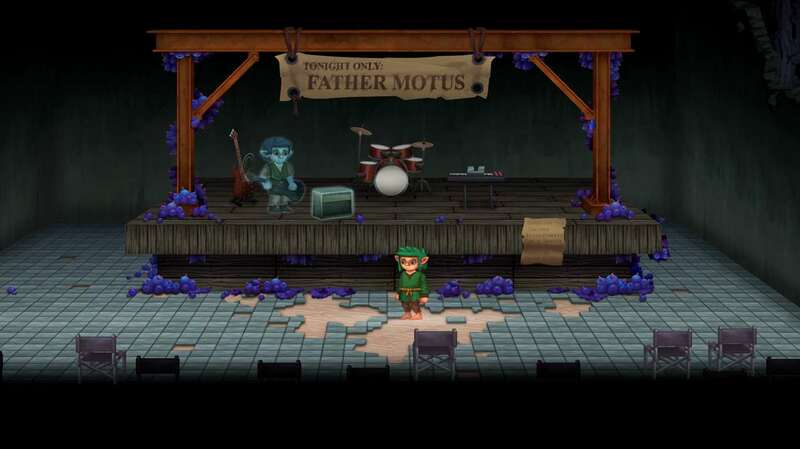 This leads some titles to try to stand out from the crowd and offer up something a little different from time to time, and for this review we take a look at MichaelArts stylish puzzle platformer The Path of Motus, the question though is, does the game stack up against other titles within the same category, or does it even do enough to make itself different from the herd, let us read on and find out shall we? Being a puzzle platformer it can sometimes be difficult to try to reinvent the wheel so to speak, and this title doesn't do that, instead it attempts to add a couple of extra notches or gears to said wheel and offer some puzzle deviation in the form of math equations varying in difficulty the further on into the game you get. The game does have a plot, however I would be lying if I had said I had paid much notice as to what was going on, It is easy to pick up the general gist of what the story is, but it is told in such a cumbersome way of you having to select characters to talk to sometimes and read the speech bubbles they give out, where as some will just come intrude on you and give you their life stories instead. I just found myself skipping most of them as I think you would do also. As I mentioned in the previous paragraph however the game does have you fighting off various foes in order to progress further into the game, and to do that you have to essentially play I guess what you could call a simplified battle version of rock, paper, scissors, where the enemy will fire a certain color ball at you which you either need to attack first with a different color or block said attack with the same color. The enemies however usually will pause for a couple of seconds between turns and the game tells you which color they will attack with next making it super easy to counter and defeat the enemies. Unfortunately by killing these enemies you will not get what the game clarifies as taking the high road which you need to do to get the games true ending. To take the high road you have to get through certain battle areas without killing another enemy or letting them kill civilians. These can usually be beaten however by sometimes being clever with your platforming or just by rushing through an area quickly. Whilst the game goes on you will be met with a couple of different takes on enemy types such as ones that fire shots at you which you cannot block and need to avoid and dodge before trying to take out said enemy yourself, the game does not feature any boss types however and you learn of defensive skills midway through the title, which fairness you don't really ever need to use apart from when the game is trying to show you them initially. The game is really rather short though clocking in at around ten minutes to beat each of the three stages of life if you speed run through, meaning that their isn't really much time to introduce you to a wide range of gameplay tropes and in turn is why this section is rather on the short side. However having faced no glitches during my time playing and enjoying what the game tries to achieve I wished the title had been a little longer so I could of used some of the gameplay tropes a few more times instead of essentially being throwaways after a short amount of time. Graphically Path of Motus doesn't really do anything wrong, but then again this may also be one of the games short comings, the game looks pleasant and colorful enough with some of the backgrounds that have been designed and drawn. Sometimes some of the environments look really well drawn out and animated and then sometimes you get the odd bit of blandness that strikes in, such as the forestry areas. The game graphically seems to shine when you hit some of the more niche parts of the title like the future forest area and even the beach at the end of the game, it is these areas that probably look the best all around and dare I say seem to look like they had the most thought put into them. Some of the side areas you explore though are more than capable of also offering up some nice environments. Areas such as the school where you need to save your girlfriend who is in trouble via what we can only presume are bully's and the tree house area early on in the game also add some deviation to what will seem like an eternity of walking past the same forestry kinda backdrops. The puzzles in the game and the overall animations however are all animated well, the puzzles are kept clean looking and easy to understand what the game wants you to do. One final note being though that some deviation in character design would of been nice, as everybody looks the same apart from some more than questionable character coloring's on some like they just spent a week on a hot vacation to Egypt with no lotion. Somebody needs some aftersun, maybe that is why he is so mad at us? when the game loads initially you will be met with quite a nice if somewhat strange tune made by the developers, in truth I did take a few moments out to have a listen to the opening track to hear what the lyrics had to say and found myself humming along to the background tune before long. However whilst in game things seem to take more of a downturn. In game you get met with some cutesy music which isn't really anything to write home about but it does help pass the time, and towards the end of the game you will get met with another track where the devs sing to you which again is another nice tune to listen to and a perfect mood setter for what you will believe is the end on the first run. During combat however the characters always make the same noise whenever they fire out an attack, and whilst it is ok at first it soon becomes grating and can even take away from the tone and the music in the background. It does become very clear that in the audio department, the title doesn't offer much in the way of variety, however with the game being on the short side what is on offer is more than serviceable. Seeing as you can either play this game once in whatever way shape or form you want, or go into the kind of new game plus mode the title transfers you to upon initial completion to try to get the pacifist achievement. The difficulty here really differs depending upon those following choices and play styles, being able to play the game however you like and working out whichever puzzles you want to work out can easily make this game completable in probably 20 minutes, where as if you try to do every puzzle, and see everything there is to see, and then go back and try to take the high road scenarios in each action sequence the difficulty to complete the game probably goes up an extra couple of notches. 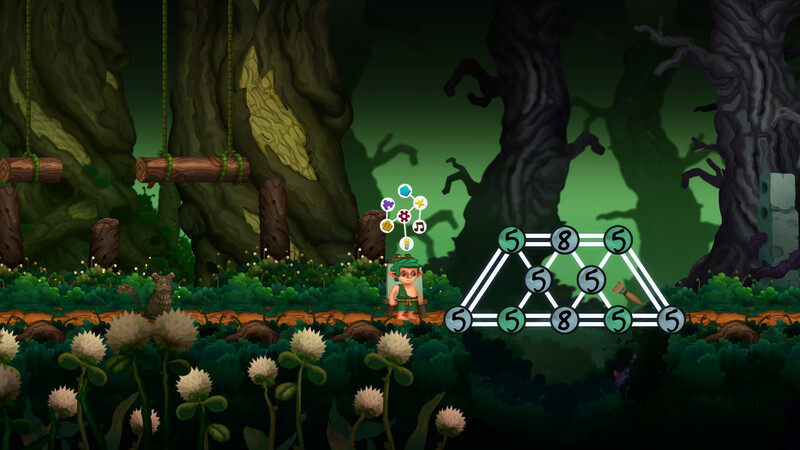 With these things being said however, no matter how you play The Path of Motus, you will be in for an easy ride, sure some of the number puzzles will take some brain scratching and a few tries, but usually if you take a step back and look at how the puzzles are connected they become really quite simple. The high road challenges will maybe no doubt be what will keep people playing the longest, as sometimes the road to take to get the high road for not killing anyone, can be a little difficult, especially if you cannot master the long jump mechanic. Sometimes with achievements in games, less can sometimes mean more, especially in story driven titles, however within The Path of Motus, what the achievement list here happens to do is show just purely how little content you get within the game. You have some story progression achievements scattered around the list, as well as one for getting to the end of the game no matter how you played, then you also have the obligatory pacifist achievement for killing no bad guys in a playthrough. If you also get the collectibles along the way you will have basically seen everything the game has to offer as well has seeing yourself with the maximum amount of gamerscore for this title. If you take your time this whole thing will probably take you about an hour or two to obtain everything, but with a guide you could easily run through this list in under an hour. If the game was slightly longer it would of been interesting to see other maybe more creative achievements. I can't help but feel I have been all but too critical on the Path of Motus for this review, but in truth the time I spent with this title, I actually enjoyed what I played, the game seems to maybe appealing to the younger audience with its art style, short gameplay and as well as easiness. This is what makes the game a good pick up and play title, and hey who doesn't like a good math problem within their game. However with that said, just purely based on the sheer lack of content provided within the game, I cannot recommend the game on the price point it is currently listed at, even at a sale of 33% I think I would struggle to tell people to go out and buy it. I feel like the game is one that would suit better at the five dollar and under category. But with all this said I am interested to see what these aspiring and young developers try their hand at next.